Let's continue our hayride with OpenSuSE. The last time we visited this operating system we took a look at the stellar YaST tool (see my article "YaST: Yet Another Setup Tool"). From within that tool you could easily access the YaST Software Installation tool for OpenSuSE. This tool is about as user-friendly as any of the Linux Add/Remove Software tools and in this article we will examine how it works. Although, at first blush, it might seem the YaST Software Installation tool might be more suited for the power user (at least as far as GUIs are concerned), when you finally examine the tool, you will see otherwise. 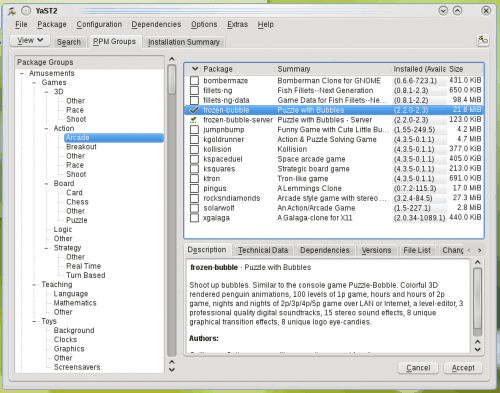 The OpenSuSE Add/Remove Software tool is easy enough for any experience level. So, with that said, let's take a look at the YaST Package Manager. As I said in the intro, there is more than one way to start this tool: From within YaST itself or from within the main menu (Start > Computer > Install Software). NOTE: If you're looking for the command line tool, we'll cover that in another article. When you first start the tool you will have to enter your root password and then the tool will start running through a few checks. Once the tool is up and running, you will be greeted with what should be a fairly familiar window. The tab that gets focus, by default, is the Installation Summary tab. This shows you every package you currently have installed on your system. If you click on a package you can get plenty of information about that package. But let's say you want to install a particular piece of software on your OpenSuSE system. How do you go about doing that? Simple. The first thing you have to do is find the package. Let's say you want to install the game Frozen Bubble on your OpenSuSE machine. You could do this two different ways. 1. RPM Groups. If you click on the RPM Groups tab you will see all packages grouped together by category (see Figure 2). To find the software you want to install first find the main group (or category) it would fall under. In the case of Frozen Bubble, we would look in the Games group. In some cases a group will hold sub-groups. Once you have found the software you wish to install, mark it for installation and then click the Accept button. Depending upon what you are installing, you might have to accept an EULA or dependencies. 2. Search. This is simple. Click on the Search tab, enter the package your looking for, mark the results for installation, and click accept. Of course you can narrow your search results by searching for any of the following: Name, keywords, summary, description, RPM provides, RPM requires, or file list. The YaST Package Management system also has a handy feature that allows you to view software by Patterns. Patterns are software packages that are grouped together by function: Graphical Desktop Environment, Desktop Functions, Base Technologies, Server Functions, Proprietary Software, and Development. From these Patterns you can easily select a piece of software (such as KDE 4 or GNOME) and, with a single click select every piece of software necessary to install that pattern. You have now seen how simple the YaST Package Manager is to use. In my next article I will show you how to manage repositories in this same tool so you can further enhance the YaST Add/Remove Software experience. Thanks, Jack, OpenSUSE does look to be quite a professional distro. Apparently KDE Trunk is available from the build service, that seems like a perfect topic for an article.